Added on May 26, 2015 The News Wheel BMW i3 , BMW i3 donation , Conservation , new york city , New York City parks , parks , TreesCount! NYC Parks Commissioner Mitchell J. Silver, on left, and BMW’s Manuel Sattig with one of the 20 BMW i3 electric vehicles donated to NYC Parks in support of the TreesCount! census during a press conference at Julio Carballo Fields on Tuesday, May 19, 2015 in the Bronx Borough of New York. If there’s one automaker that’s become known as eco-friendly these past couple years, it’s BMW. The German automaker has drawn attention and acclaim for its electric i3 and i8 supercar made of recycled materials. The BMW i3 has quickly become an icon of future-thinking, automotive sustainability. 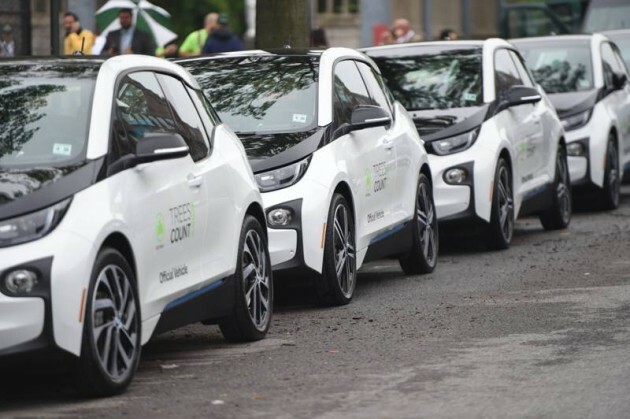 Taking environmental support one step further, BMW of North America announced a collaboration with the New York City Parks system, resulting in a donation of 20 BMW i3 electric cars. With 20 donated BMW i3 electric vehicles, NYC Parks Commissioner Mitchell J. Silver and NYC Chief Technology Officer Minerva Tantoco map the first trees of the TreesCount! 2015 census during a press conference at Julio Carballo Fields on Tuesday, May 19, 2015 in the Bronx Borough of New York. 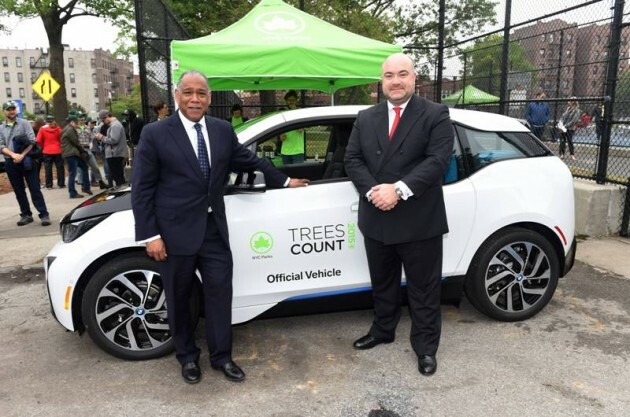 In a recent joint press conference, BMW of North America and NYC Parks reported their collaboration for the TreesCount! 2015 census program. The conference, which took place at Julio Carballo Park in the South Bronx, was attended by NYC Parks Commissioner Mitchell J. Silver and BMW North America Brand Strategy/Communication Head Manuel Sattig. 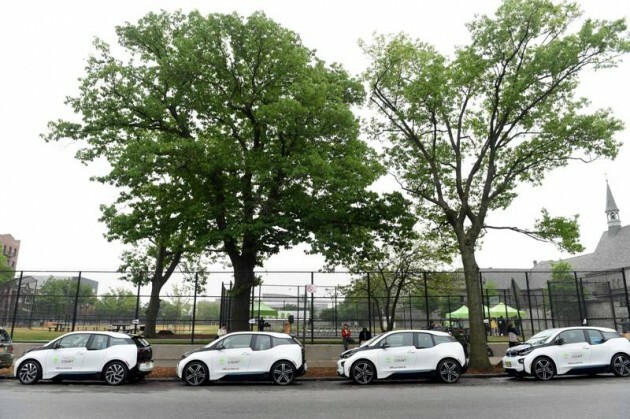 “BMW’s vision for a more sustainable future aligns closely with New York City Parks’ TreesCount! mission. 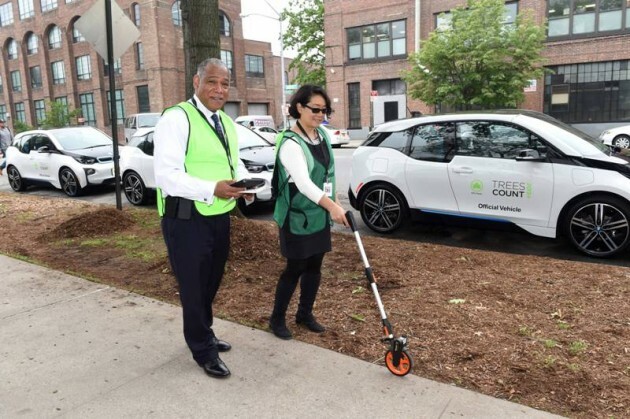 We are proud to donate 20 BMW i3 vehicles to help the city collect data that will enable it to understand the environmental and economic benefits of the street trees and inspire a new generation of New Yorkers who care about their city,” said Sattig. The vehicles will be used by Park staff members and volunteers during the 2015 TreesCount! census to travel through the five boroughs, collecting data on over 600,000 street trees. It will result in a detailed map with information on trees dotting every city block. “We are so grateful for BMW’s support as we conduct our third street tree census across New York City. The innovative BMW i3 vehicles are a perfect fit with the new technology and mapping tools we are launching during Trees Count! 2015,” stated Silver. The new BMW i3 vehicles have already been deployed throughout the city’s “urban forests,” ensuring a green future for the city.